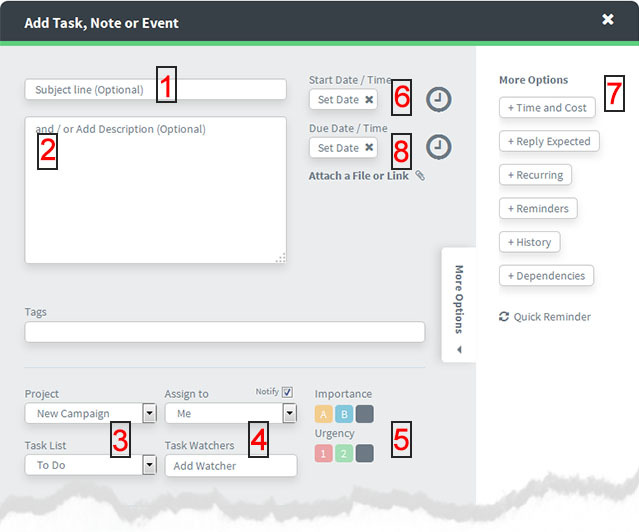 1) Using the “Add a Task” feature at the right of each screen. Either of these will bring up the “Create New Task” dialog box. You can write into the subject line (See 1) OR the text dialog box (See 2) – into which you can type in – or paste – as much text as you like. Assign the task to someone (See 4). 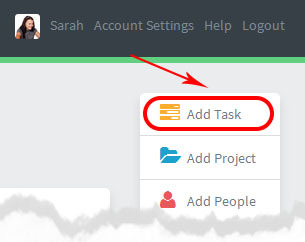 This means they get an email notification plus an automated reminder if the task goes overdue – you can add a new person to the project as you create the task. Set a priority level (See 5). Give it a Start Date and / or a Due date and time (See 6 above). Note you can set this More Options window to be closed by default in your Account Settings. 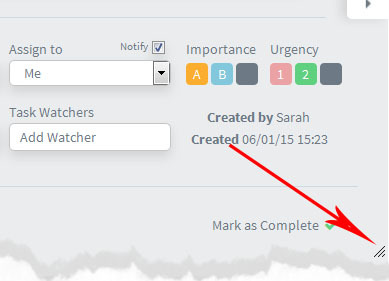 The assigned and any “Task Watchers” will get a copy of the file in their email notification. Task are in a modal resizable window.